I’ve always had a desire to write. Throughout my extensive career in logistics, I have written countless SOP’s (Standard Operating Procedure) manuals that have helped to set a standard within organizations in hopes that new employees can obtain the information and jump right in with no delays. However, once I noticed there was a need for me to lend my knowledge, skills, and experience to the industry, my decision to become a writer was virtually effortless. When writing Freight Broker with Care, did anything stand out as particularly challenging? As I began writing, I assumed it would have been challenging to create unique content that has not already been presented by other independent freight brokers. However, after further research, it made more sense as to why so many people valued my knowledge – most of the information that is widely available doesn’t even come close to scratching the surface on some of the details that I cover extensively in Freight Broker with Care Vol.1. How did you come up with the concepts and ideas in Freight Broker with Care? I focused on the top questions and concerns asked by those who are just starting out in the field. From there, I gathered, compiled, and analyzed this information, basing the structure of the book around my findings. Great question! Most days I am quite involved in my projects, but I have managed to make some free time outside of writing and am currently training for a half marathon. I am also a combat veteran and am in tremendous need of a physical challenge again. Thank you for asking. My readers can find me on all social media platforms. I’ve published several YouTube videos that provide value added information for new freight brokers, including freight broker affirmation songs, blog articles, and a training course website that many are raving about! You can find me on Facebook, Instagram and Twitter just key in Freight My Way. 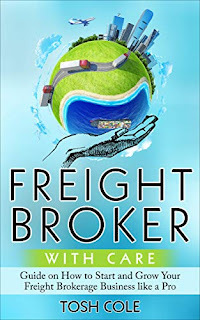 My blog site and YouTube channel is Freight Broker My Way, and to purchase the book, Freight Broker with Care from your favorite online book store please check out these links books2read.com/u/bzLKPE and https://books2read.com/u/m2xd86 for more details. And oh, one more thing; I have a freight broker trainer course package coming soon. This training course is jam-packed with valuable information, so feel free to bookmark the link it is www.freightbrokertrainercourse.com. Many people have expressed their eagerness for its release, so my team and I are working around the clock for its speedy completion. I truly appreciate all of the kind and thoughtful reviews and support.